MX Player is the best video player for Android devices which packed with tons of features. However, due to some licensing issues, the official MX Player has removed some of its audio codec supports such as AC3, DTS, MLP in the last few updates. When you play your favorite videos in MX Player, you may get an error: “This audio format (AC3) is not supported”. In such scenarios, the video will be played fine but there is no sound. So, what should you do? Delete the video or uninstall the MX Player? Take it easy. In this post, we are going to show you how to fix AC3 audio format not supported error in MX Player. Launch the MX Player, click on “Option” then proceed to “Settings” from the main menu. Choose the “Decoder” option, then scroll down until you see the “Custom codec” option. Open the “Custom code” and you will find the codec that is required by MX Player. 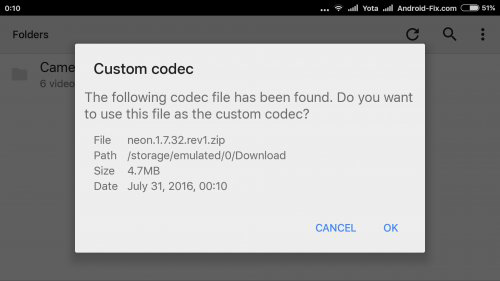 Now click here to download the required custom codec according to the version of the MX Player that currently running on your Android device. After downloading, open the MX Player again and the app will auto-detect the downloaded codec if compatible, tap “OK” from the pop-up notification. The Player will ask you for restart, just tap “OK” to submit it again. After that, you will be able to play the video files properly in MX Player with the sound. Open the MX Player app, click on Settings and navigate to the option “Decoder”. Scroll down to the bottom to find the “Custom codec” option, click on it and a selection pop-up will appear on your screen. Now choose the correct patch of your custom codec that you have downloaded. Having fetched your new codec, MX Player will automatically load the custom codec from the pack and restart. That’s all. It is easy to fix AC3 audio format not played in MX Player issue. 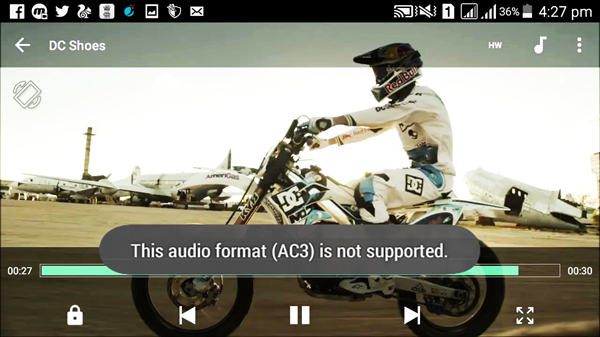 Now you can freely play videos with AC3 audio in MX Player. Besides downloading and adding the custom codec to MX Player, another way to solve this issue is using a desktop video/audio converter to encode MX Player unsupported AC3 to a more compatible audio format like MP3. For example, Gihosoft Free Video Converter supports a large number of input and output options. Using it, you easily convert AC3 format to MP3 audio that can play on MX Player.